Several of you have asked if we still give a Birthday discount, and the answer is "Yes"! To honor your birthday, you will receive a 20% discount off one entire purchase made the week before or after your birthday. 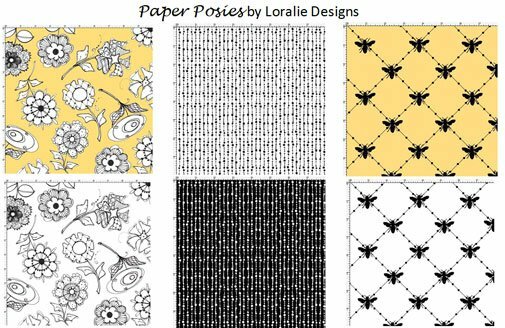 From Loralie Designs, "Paper Posies", is a fun, whimsical collection featuring posies and bees and 'beaded curtains' coordinates in black, white, and yellow. We have three new indigo fabrics from Alexander Henry's "Indochine" collection. 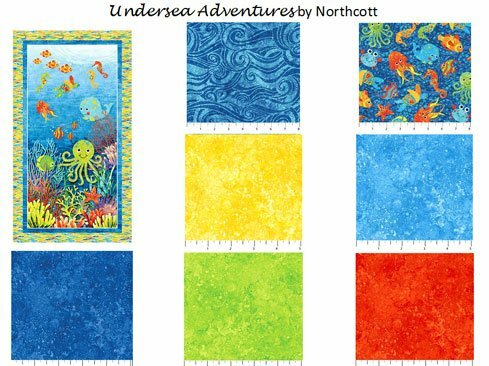 And, two new kids collections--"Undersea Adventures" from Northcott, featuring cute ocean creatures and bright Stonehenge coordinates; and "Arctic Friends (flannels), also from Northcott. One of these flannel prints features large animals that can be cut out and appliqued onto quilts or sewn together to make adorable animal pillows! 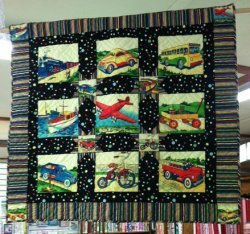 We have two new quilt kits made from original Thistle Dew patterns--"Indigo Crossing" and "Transportation". We still have several Bali Pops at 20% off! 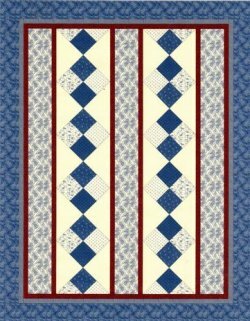 Hand Piecing, Tue, Mar 26, 9:00 - 11:00 a.m.
Crazy Quilt Group, Mon, April 1, 10:30 a.m. - 1:30 p.m. 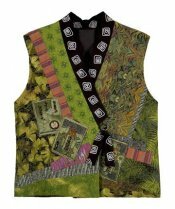 Sit & Sew, Thu, April 11, 1:00 - 5:00 p.m. 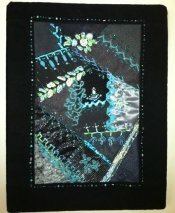 Ten Symbols of Longevity Wool Clock Quilt, Rami Kim, Thu, Mar 28, 10:00 a.m. - 3:00 p.m., $48, supply list. In Asia, there are ten symbols of longevity: sun, mountain, cloud, rock, water, crane, deer, turtle, pine tree, and herb of immortality. Rami designed a felted wool wall hanging using these symbols and installed a clock movement kit to create a unique wall clock for your home decor. 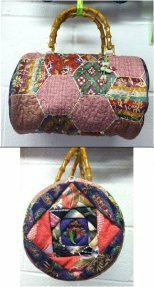 Bolster Purse with Folded Pineapple, Rami Kim, Thu, Apr 4, 10:00 a.m. - 3:00 p.m., $48, supply list. Rami has designed another beautiful purse--this one in a bolster shape with circular folded pineapples on each end. Make it in bright colors for the perfect Spring/Summer accessory! Waldorf Doll Class, Diana Collins, Sat, Apr 6, 10:00 a.m. - 4:30 p.m., and Sun, Apr 7, 1:00 - 3:00 p.m., $55, supply list. Learn all the aspects of Waldorf-style doll making, as you make a 16” Waldorf Doll. This class is for you if you are new to doll making, or if you have already made a doll but just need a refresher. You will learn to make a shaped head, (which can be applied to any size and type of doll) and how to make the doll’s facial features and hair. You can even learn about designing or making the doll’s clothes from patterns or your own imagination. Supplies will be available for purchase in class. You can buy a complete kit for $35, which includes the pattern, doll skin, yarn for hair, wool for stuffing, and stockinette for the inner head.